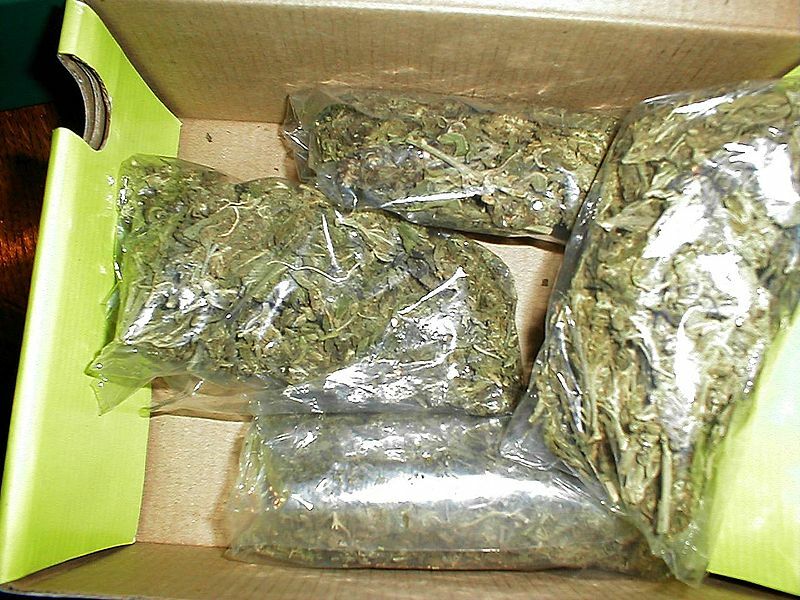 Four-ounce bags of marijuana. Photo from Wikimedia Commons. A holdup at an unlicensed East County medical marijuana shop erupted in gunfire Tuesday, wounding a good Samaritan and an alleged robber, who later was arrested along with a suspected accomplice. The shooting in the 9000 block of Campo Road in Spring Valley was reported about 11 a.m., according to sheriff’s officials. Deputies arrived to find a 32-year-old man suffering from a gunshot wound to the leg, Lt. Chris May said. The victim, a worker at a smoke shop next door to the illicit cannabis operation, was shot while coming to the aid of the people being robbed, the lieutenant told reporters. A short time later, a deputy pulled over two suspects on a nearby street. The passenger, identified as 29-year-old James Crutcher, jumped out and escaped on foot, despite having been shot several times during the robbery, May said. The driver, 30-year-old Frank Daley, resisted arrest, according to Mays, but was eventually taken into custody after the patrolman sicced a service dog on him. Deputies eventually caught up with Crutcher in the 4100 block of Camino Paz and took him into custody. Both suspects were taken to a hospital. Sheriff’s officials did not immediately disclose who fired the shots that wounded Crutcher and the smoke-shop employee.